Judge Garcia (ret.) was appointed by the Supreme Court as an initial CJEO member in 2009. He began his judicial career in 1987 on the Sacramento Municipal Court. 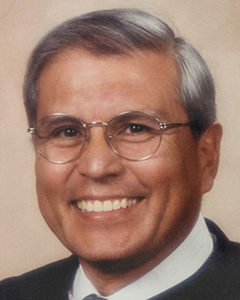 Judge Garcia was appointed to the Sacramento County Superior Court in 1989 where he served as the court’s presiding judge. He also served as the presiding judge of the appellate department and on the court’s executive, technology, and education committees. In 1995, Judge Garcia served as the acting presiding judge and grand jury advisor to the El Dorado Superior Court. As a member of the California Judges Association (CJA), Judge Garcia served as chair of its judicial discipline advisory panel and on its discipline and disability committee. His judicial ethics experience also includes serving as a special master for the Commission on Judicial Performance. Judge Garcia has served the judicial branch and the public as a Judicial Council member, on the Commission for Impartial Courts judicial candidate campaign task force, and on the Court Management System Oversight committee, on the Trial Court Presiding Judge executive committee, and several other Judicial Council committees and working groups. Judge Garcia is actively involved in judicial education as a faculty member at the Center for Judicial Education and Research (CJER), as dean of the B.E. Witkin California Judicial College, and as chair of the New Judge Education Committee and Continuing Judicial Studies Programs. He has also been a frequent teacher and seminar leader for both CJA and CJER and has served as the director of the Advanced Science and Technology Adjudication Resource Center, a judicial education nonprofit. In 1988, Judge Garcia received the Unity Award from the La Raza Lawyers, Wiley Manuel, and Asian Bar Associations of Sacramento. He was awarded Judge of the Year in 2003 by the Sacramento County Bar Association. Judge Garcia retired in 2009 and participates in the Chief Justice’s Assigned Judge Program.